To be honest, I’m guessing a little here. 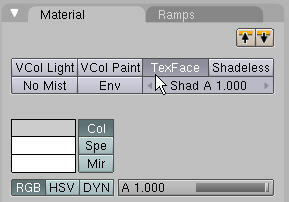 In the Material panel, have you clicked on “TexFace”? yay it does work for the render but I still get this weir effect of transparency while i navigate trougth my scene…but thank you very much <_<"
okay yeah… i know whats happening but i dont know why it does that. it has somthing to do with object’s faces or somthing. okay so im not much help! but if you can find those orintation buttons and mess with them a little you might be able to fix your problem. i think one of the buttons say “double sided” i think. well I have located this double sided thing but it doesn’t seems to work either…but I think this face orientation has something to do with it but problem is really when i change my drawing type to texured that transparency is really anoying what will I do when I will come to a way more complicated scene!!! >_<"anyway thanks to have tried ! Everyone gets that transparency effect, it lets you know which direction your normals are facing.